This section provides some basic concepts about the chemistry of water - explained in very simple terms - and is intended for curious minds who wish to better understand the science behind water ionization at the molecular level. An atom consists of positively charged protons, electrically neutral neutrons and negatively charged electrons. At the centre of the atom, neutrons and protons stay together to form the atom’s core or nucleus. Electrons revolve around the atom’s core in three-dimensional orbits or shells. Each of these molecular orbits needs a certain number of electrons to be stable. The inner orbit closest to the core must contain 2 electrons to be stable. The second orbit must contain 8 electrons to be stable. Each subsequent orbit, for atoms that contain more than 10 protons and electrons, also requires a pre-defined number of electrons to be stable. But apart from inert gases such as helium, neon and argon, the outermost orbit of most atoms is missing one or more electrons to be stable. In order to reach a state of stability, atoms bond together to form molecules by sharing their valence electrons, or electrons that make up the outermost shell. This sharing can be achieved through covalent bonding as described below. Covalent bonding is a form of chemical bonding between two non-metallic atoms, such as hydrogen and oxygen, which is characterized by the sharing of pairs of electrons between two or more atoms. For stabilization, they share their valence electrons with other atoms. A water molecule is an example of a molecule created through covalent bonding. 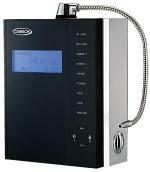 Water is made up of one oxygen atom and 2 hydrogen atoms, hence the chemical symbol H2O. A hydrogen atom is made up of 1 proton at its core and 1 electron that revolves around the core in a three-dimensional orbit. 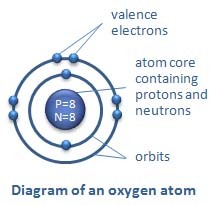 An oxygen atom is made up of 8 protons and 8 neutrons at its core and 8 electrons that revolve around the core in 2 separate three-dimensional orbits. The inner orbit contains 2 electrons whereas the outer orbit contains 6 electrons. However, both the hydrogen atom and the oxygen atom are not stable when they are alone. 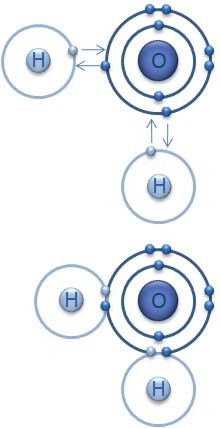 In order to be stable, the hydrogen atom must contain 2 electrons in its shell, and the oxygen atom must contain 8 electrons in its outer shell. To reach this state of stability, both hydrogen and oxygen atoms create covalent bonds with each other, as illustrated in the diagram on the right. In a water molecule, two hydrogen atoms are covalently bonded to the oxygen atom. But because the oxygen atom is larger than the hydrogen atom, its attraction for the hydrogen's electrons is correspondingly greater so the electrons are drawn closer in to the orbit of the larger oxygen atom and away from the hydrogen orbits. This means that although the water molecule as a whole is stable, the greater mass of the oxygen nucleus tends to draw in all the electrons in the molecule including the shared hydrogen electrons giving the oxygen portion of the molecule a slight electronegative charge. The orbits of the hydrogen atoms, because their electrons are closer to the oxygen, take on a small electropositive charge. This means water molecules have a tendency to form weak bonds with other water molecules because the oxygen end of the molecule is negative and the hydrogen ends are positive. Water is a universal solvent due to the marked polarity of water molecules and their tendency to form hydrogen bonds with other molecules. To illustrate water's ability to break down other substances, consider the simple example of putting a small amount of table salt in a glass of water. Table salt, also known by its chemical name sodium chloride [NaCl], is an example of an ionic compound, which means that one of the atoms involved stole a valence electron from the other. In this case, the chlorine atom [Cl], stole an electron from the sodium atom [Na], resulting in the creation of an electronegative chloride ion [Cl-] and an electropositive sodium ion [Na+]. 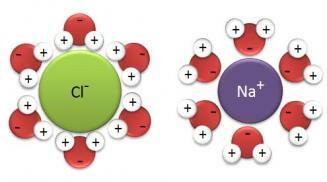 The two ions are bonded together because of the attraction of opposite charges. After salt is placed in water, the ionic bond between the sodium and chloride ions is broken due to the competitive action of the water molecules that outnumber the salt molecules. The electronegative oxygen pole of the water molecule is attracted to the positively charged sodium ions [Na+], and the electropositive hydrogen pole of the water molecule is attracted to the negatively charged chloride ions [Cl-]. 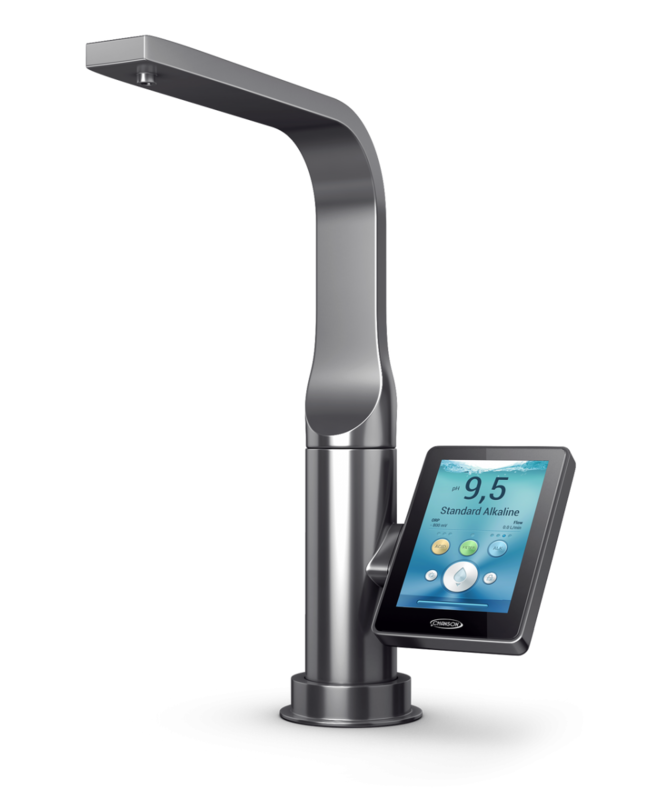 As with the example of table salt, water has the ability to dissolve many unwanted substances that have accumulated in our bodies over time, such as solid waste and toxins, and to flush them away through the body’s natural elimination channels such as lungs, colon, kidneys, liver, and skin.